Source: Received via NetGalley in exchange for an honest review. 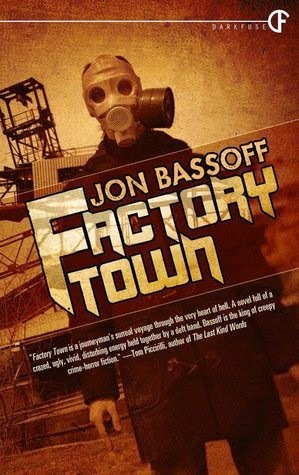 I've found some really amazing books outside of my normal genres over the last year, and thought I'd give it another go with Factory Town. Russell Carver, an enigmatic and tortured man in search of a young girl gone missing, has come to Factory Town, a post-industrial wasteland of abandoned buildings, crumbling asphalt, deadly characters, hidden secrets and unspeakable depravity. Wandering deeper and deeper into the dangerous, dream-like and darkly mysterious labyrinths in town, Russell stumbles upon clues that not only lead him closer to the missing girl, but to his own troubled past as well. Because in Factory Town nothing is what it seems, no one is safe, and there's no such thing as a clean escape. Factory Town is a challenging, surreal read that immerses the reader in a hellish dreamscape. This book is very heavy on atmosphere, and requires the reader to buy into its unique narrative form. Yes, there's a story being told, but it's not clear-cut nor linear, and if you require something even as simple as having dialogue marked with quotation marks, you're going to have a hard time with Factory Town. I had a love-hate relationship with the fluid narration. Russell's situation is constantly changing, and I did find it a little frustrating to never be able pin down what was happening. I realize that this is sort of at the heart of the story, and there was a cleverness in the way that Russell's past is woven into his search for Alana, the missing girl. However, it reduced the terror or horror component for me because there was so much slippage that I lost sense of what the stakes were. Everything blurred together into one dimension of doom and that inured me to the details. In terms of the story itself, the prologue was really the key for grounding my understanding of the book's direction. Embracing that as the frame for everything that happens made some of the more surreal or impossible-seeming twists and turns make some sort of sense. Again, I had to work for it because I did lose sight of that prologue a number of times, but ultimately I think it's worth keeping it in the forefront of your mind while you read. Factory Town surprised me by going for total immersion in a terrifying world of misfits, murderers and generally creep-tastic characters. Unfortunately I rapidly became too used to *everyone* falling into these categories and that desensitized me to the truly horrifying elements of the book. The complex narration was overpowered by my blase attitude towards the journey and I simply didn't enjoy the book very much. That said, I can appreciate that Factory Town really was swinging for the fences, and I think with more reflection the book could grow on me. For fans of horror, the macabre and grotesque, complicated stories. Thanks for reading my novel and thanks for such an honest, well-thought out review. I really appreciate it!